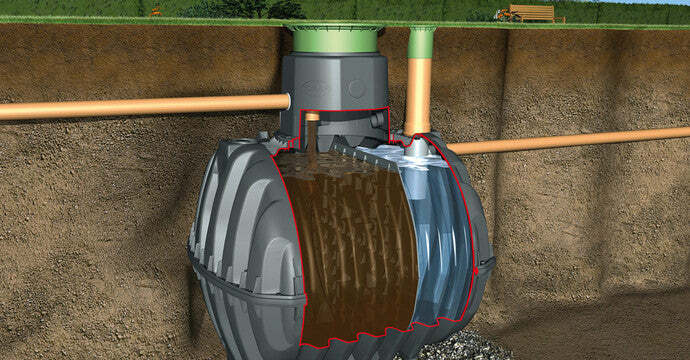 Wastewater Septic Tank - 4 to 13 people – Freeflush Rainwater Harvesting Ltd.
Septic tanks represent a low tech solution and may be acceptable depending on the application. Floating and removable material is extracted from domestic wastewater in mechanical septic tanks. This is pure mechanical cleaning, for which you need 500 l of capacity per inhabitant. 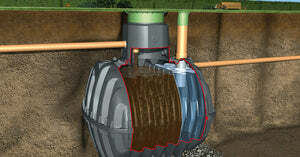 If you assume a volume of 150 l, the wastewater passes through the system in 3 days. These septic tanks must have a total volume of at least 2,000 l. A 2,000 l system is sufficient for 4 inhabitants, another 500 l, must be incorporated for each additional inhabitant.